If you do not want your ProProfs site to be visible to the general public, you can restrict access to it by using the private site feature. Then anyone who navigates directly to your site’s URL would not be able to view your ProProfs site. A user in ProProfs is someone that can log in and author help pages, administer the application, add content, and more. What actions ProProfs users can perform depends on their role. People who read your documentation logged-out (such as your customers) are called end users. ProProfs does not have a user management system for your end users. Instead, you can use your authentication/login system via Single Sign-On (SSO) to authenticate your end users. If you do not want your ProProfs site to be visible to the general public, you can restrict access to it by using the Private site feature. Then anyone who navigates directly to your site’s URL would not be able to view your ProProfs site. You can set it up to redirect end users to another URL. Step1. Log in to your account (as an Administrator) and click Settings. Step3. Select the site which you want to make private from the list of sites. Step4. 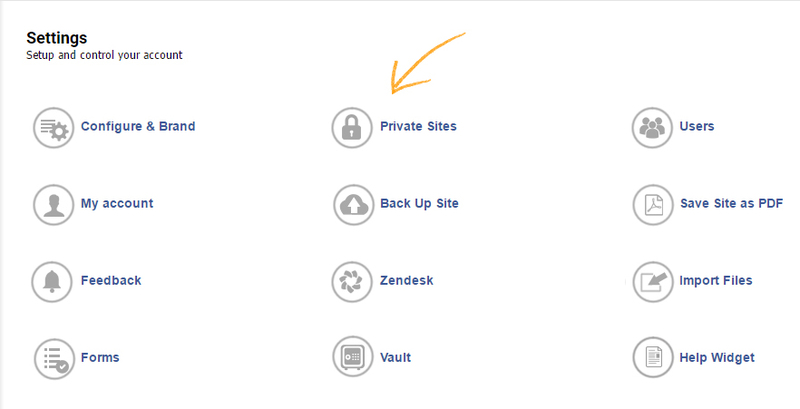 Enable private sites by clicking on the toggle button (refer to the image below). API Key - Use API key when you want multiple private sites accessible to a single user. The API key is a unique alphanumeric sequence used as an authentication medium for all of your private sites. Site Key - Use SiteKey when you want a single private site accessible to the end-user. SiteKey is a web-based security system that provides mutual authentication between end-users and websites. SiteKey authentication is capable of eradicating phishing and protecting your end-users from online frauds. It is a unique alphanumeric sequence which works for a single private site so you can prevent unauthorized access to your site. Contextual Help > Allow public view access to contextual help - You have the option to make the contextual tools accessible for logged out users even if Privacy is enabled for the site. Redirect URL - This is the URL the end user will be redirected to when trying to access your ProProfs site directly. It could be your web application's login page, for example, http://myapp.com/login. If you enable this, then anyone trying to view your site will be redirected to your login page. 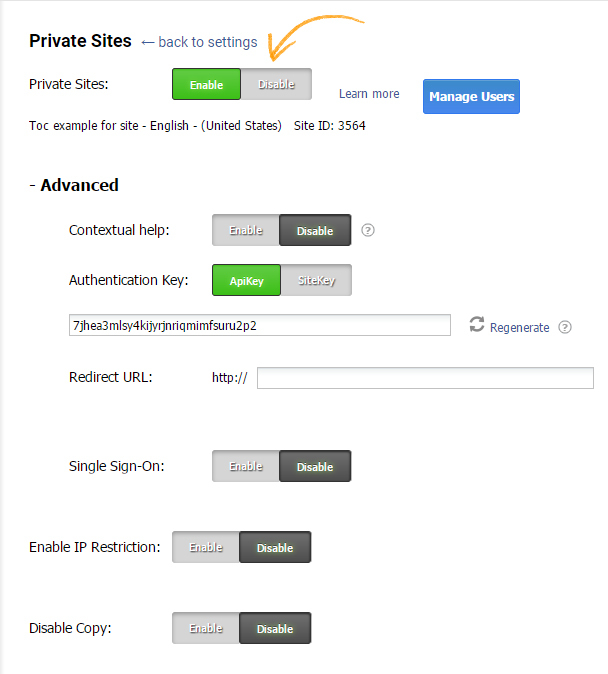 Single Sign-On - Enable single sign-on for your site.